Punch Brothers On Mountain Stage Founded by mandolin virtuoso and Nickel Creek alumnus Chris Thile, the band plays traditional bluegrass instruments while immersed in progressive compositional ideas. Hear the group show off selections from their new suite. "The Blind Leaving the Blind, 1st Mvt." "The Blind Leaving the Blind, 4th Mvt." 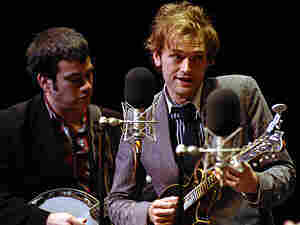 After the popular roots-pop trio Nickel Creek disbanded in 2006, mandolin virtuoso and songwriter Chris Thile set out to form a new group, now christened the Punch Brothers. Featuring a who's-who of contemporary bluegrass players — fiddle player Gabe Witcher, banjo player Noam Pikelny, guitarist Chris Eldridge, bassist Greg Garrison — the band represents the newest of the new-grass brigade, updating the genre's instrumentation with a progressive mentality. Selections from Thile's epic chamber work for bluegrass instruments — the four-movement, 40-minute "The Blind Leaving the Blind" — highlight this live performance from an episode of Mountain Stage recorded in May 2008. Also included here is "Punch Bowl" and "It'll Happen" from the group's official debut, Punch, and a tune from How to Grow a Woman from the Ground, a CD recorded by the same band under Chris Thile's name. This segment originally ran July 21, 2008.